Department of Pharmaceutical Analysis 1, Smt. Sarojini Ramulamma College of Pharmacy, Seshadrinagar, Mahabubnagar - 509001, Telangana, India. Gland Institute of Pharmaceutical Sciences 2, Kothapet, Medak - 509001, Telangana, India. ABSTRACT: An accurate, simple, new, precise, rugged and stability indicating method was developed for simultaneous estimation of sitagliptin and metformin HCl in tablets. The developed method was rapid and economic. The Chromatographic separation was achieved isocratically on a C-18 column by using ammonium acetate buffer (adjusted to pH 5.0 with glacial acetic acid): MeOH (60:40 v/v). Octane -1-sulfonic acid sodium salt was used as an ion pair agent. Flow rate of 1mL/min with dual wavelength UV detection (265nm for sitagliptin & 225 nm for metformin) was used. The retention times of metformin and sitagliptin are 2.398 min and 17.113min respectively. The developed method was specific and well separated from the impurities of both sitagliptin and metformin. 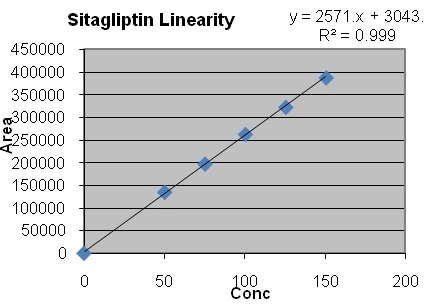 The method is linear in a range of 50% to 150% for both sitaglitpin and metformin. 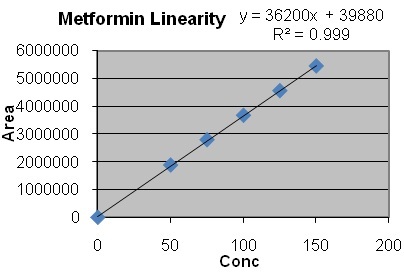 The correlation coefficient was found to be r2= 0.9997 & 0.9998 for sitagliptin and metformin respectively. Both standard and test solutions proved to be stable for up to 48 h. Forced degradation study showed that the method is stability indicating. 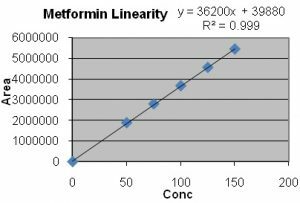 The developed method can be used for routine analysis of sitaglitpin and metformin fixed dose combination. INTRODUCTION: Sitagliptin Phosphate mono-hydrate is a white to off-white, crystalline, non-hygroscopic powder, soluble in water and N, N-dimethyl formamide, slightly soluble in methanol and very slightly soluble in ethanol, acetone, and acetonitrile. This is an oral anti hyperglycemic of the dipeptidyl peptidase-4 (DPP-4) inhibitor class. This enzyme-inhibiting drug is used either alone or in combination with other oral anti hyperglycemic agents (such as metformin or a thiazolidinedione) for treatment of diabetes mellitus type 2. Its molecular formula is C16H15F6N5O•H3PO4•H2O and molecular weight is 523.32 g/mol 1. Metformin hydrochloride (N, N-dimethylimidodi carbonimidic diamide hydrochloride) is a white to off-white crystalline compound. The pKa of metformin is 12.4. The pH of a 1% aqueous solution of metformin hydrochloride is 6.68. Metformin hydrochloride is freely soluble in water and is practically insoluble in acetone, ether, and chloroform. Molecular formula = C4H11N5.HCl. & Molecular weight = 165.63 2, 3. Sitagliptin - Active pharmaceutical Ingredient (API) – MSN Laboratories Limited Hyderabad. Metformin HCl – MSN Laboratories Limited Hyderabad. HPLC grade methanol, Glacial acetic acid, Octane -1- sulfonic acid sodium salt, water were used. Other chemicals and reagents like ammonium acetate, HCl, NaOH, H2O2 of AR grade were used. 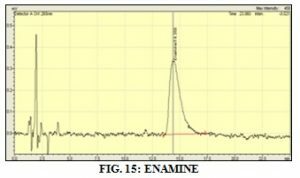 Instruments Used: Analysis was performed by using analytical balance precisa XB220A, HPLC used is Shimadzu LC-2010 with PDA detector. Column used in HPLC is Zorbax SB-C8, 150 X 4.6 mm, 3.5 µm. Other equipments like sonicator, water bath, hot air oven of thermo make were used. Buffer Preparation: Weigh 1.54 g of ammonium acetate and 0.58 g Octane-1-sulfonic acid sodium salt, dissolve in 1000 mL of Milli-Q-Water and adjust the pH to 5.0 with glacial acetic acid. Filter this through 0.45 µm PVDF membrane filter. Mobile Phase Preparation: Mix methanol and buffer in the ratio 40:60. Standard Stock Solution-1: Weigh 100 mg of Metformin HCl into a 100 mL volumetric flask, dissolve and dilute to the mark with diluent. Standard Stock Solution-2: Weigh 64.10 mg of Sitagliptin phosphate monohydrate (equivalent to 50.0 mg of Sitagliptin) in to a 50 mL volumetric flask dissolve and dilute to the mark with diluent. Take 5 mL of Standard Stock Solution-1 and 5 mL of Standard Stock Solution-2 in to a 50 mL volumetric flask, dilute to the mark with diluent and filter through 0.45 µm PVDF filter. Stock Solution: Weigh placebo equivalent to 2 tablets of sitagliptin and metformin HCl of 50-850 mg strength) and transfer into 200 mL volumetric flask and add about 150 mL of diluent. Sonicate for 30 min. Allow it to cool to room temperature and make up to the volume with diluent. Filter a portion of the sample solution with 0.45 µm PVDF filter. For Sitagliptin: Transfer 10 mL of filtered stock solution to 50 mL volumetric flask and make up to the volume with diluent and mix well. For Metformin HCl: Transfer 1 mL of filtered stock solution to 100 mL volumetric flask and make up to the volume with diluent and mix well. Preparation of Test Solution (Conc. 100 ppm for Sitagliptin and Metformin HCl): Weigh 20 tablets take the average weight of tablets and crush to fine powder. Transfer the crushed powder equivalent to 1700 mg of metformin HCl and 100 mg of Sitagliptin into a 250 mL volumetric flask, add 150 mL of diluent and sonicate for 30minutes. Make up to the mark with diluent and filter through 0.45µm PVDF filter. Sitagliptin Test Solution: Take 5 mL of Test stock solution and dilute to 20 mL with diluent. Metformin HCl Test Solution: Take 3 mL of Test stock solution and dilute to 200mL with diluent. Specificity: Injected blank solution, placebo, standard, individual impurities and test solutions in to the chromatograph after system suitability. No Interference was observed at the RT’s of sitagliptin and metformin from blank, impurities and placebo solutions. Where; At = Area of test solution, As = Area of standard solution, Ws = Weight of standard taken (mg), Wt =Weight of Test taken (mg), Avg. Wt. = Avr. Weight of tablet (mg), LC = Label Claim of the tablet (mg), MF = Molecular factor (Sitagliptin-0.81; Metformin-1), P = Potency of the working standard. Linearity: Determined the Linearity by plotting a graph between concentration of the test solution on X-axis and response of the corresponding solutions on Y-axis, from 50 % to the 150 % against standard concentrations for both the analytes. Accuracy: Performed the accuracy of test method using sitagliptin and metformin HCl API and placebo at 50 %, 100 %, 150 % spike levels in triplicate. Calculated the % Recovery and recorded the results. Bench Top Stability of Standard and Test Preparation: Performed the assay of Sitagliptin-Metformin HCl tablets as per the test method for 50- 850 mg and kept on bench top for 48 h. after analysing the initial amount. Injected the samples at initial, 24 h and 48 h. Calculated the assay against the freshly prepared standard solution and checked the difference in assay of the samples between the initial and bench top stability samples. Rubustness: Performed the robustness by altering the flow rate by ± 0.1mL/min from 1.0 mL/min, column oven temperature by ± 5 ºC from 35 ºC and buffer pH by ± 0.2 from 5.0. Prepared the standard solution and checked the system suitability criteria by altering the above mentioned parameters. System Suitability criteria was within the limits for all the altered parameters. Filter Integrity Test: Performed the filter validation studies on sitagliptin-metformin HCl Tablets 50-850 mg by preparing the test sample. A portion of the test sample was centrifuged and the remaining portion of test solution was filtered with PVDF and PTFE filters. Calculated the % assay and calculated the difference in assay from the assay obtained by centrifuging. Forced Degradation Study: Performed the forced degradation of test method to demonstrate the non-interference of impurities, degradation products in quantification of analyte by various stress conditions like acid, base peroxide and thermal. CONCLUSION: A new RP-HPLC method has been developed for simultaneous estimation of sitagliptin and metformin HCl in marketed formulation. The method showed good resolution between the two drugs and also with degradants in forced degradation study. The two analyte peaks were well separated from the impurities of Metformin and Sitagliptin. The developed method was validated for specificity, linearity, precision, accuracy, robustness and solution stability. It proved to be stability indicating, specific, novel, simple, accurate, precise and cost effective. Hence the proposed RP-HPLC method is suitable for routine assay of linagliptin and metformin in pharmaceutical dosage forms in quality control laboratories. Desireddy RB, Sindhuri SL, Charitha A and Nagasowjanya G: Development and validation of analytical methods for the simultaneous estimation of sitagliptin phosphate and metformin hydrochloride in pharmaceutical dosage form. Pharmatutor-art-1912, 2017. Gracea AC, Prabhaa T, Jagadeeswarana M, Srinivasanb K, Sivakumarb T: Analytical methods for determination of sitagliptin: an updated review. Int J Pharm Sci Rev Res 2017; 43(1): 217-225. Sirigiri N, Subramanian NS and Reddy GNK: Stability indicating method development and validation for simultaneous estimation of Sitagliptin phosphate and Metformin HCl in tablets by HPLC. 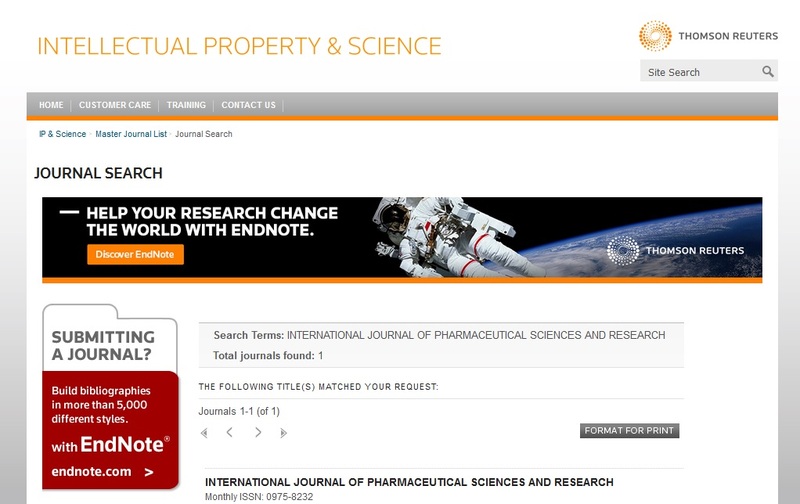 Int J Pharm Sci & Res 2018; 9(10): 4294-02. doi: 10.13040/IJPSR.0975-8232.9(10).4294-02. 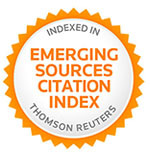 Authors Address: Department of Pharmaceutical Analysis, Smt. Sarojini Ramulamma College of Pharmacy, Seshadrinagar, Mahabubnagar, Telangana, India.